"It's almost like if you want to put a tourniquet on your arm, that's what you're doing with these dams, you're putting tourniquet on your arm, and then your fingers die - and you wonder why your finger's died. It died because you cut off the flow of blood. Water is like the blood in our body...the water is the blood of Mother Earth. You cannot do these things to it." - from Water Whisperers / Tangaroa (WickCandle Film - www.wickcandle.co.nz). "Ohinemuri was called a designated sludge canal once. It was so tragic that everything got dumped in it - all the mining stuff, cyanide waste, the community dumped its' waste. It dumped its' sewerage. That was the attitude you know - this attitude we have inherited. On Sundays they would stop the mine and they would all go to church. And then on Mondays they would open the mine back up - and the old people would see thousands of mullet and fish swimming with their heads out of the water 'cause they couldn't swim in Ohinemuri any more. It was deoxygenated from the cyanide. And I remember Uncle Tiki Rakana just saying it just made us wonder about their spirituality. They go to church on Sunday, and then they destroyed the water of Mother Earth, of Papatuanuku - they destroy it on Monday." 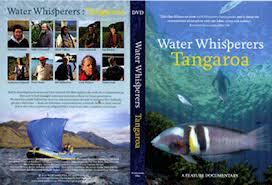 - from Water Whisperers / Tangaroa (WickCandle Film - www.wickcandle.co.nz). I am lucky enough to be involved in a composition project with film-maker/playwright Marian Evans (http://wellywoodwoman.blogspot.co.nz/), in which the poems of Muriel Rukeyser are to be set to music. These will be performed in the context of a play which explores the dynamics of three women in Aotearoa/New Zealand and examines issues of water conservation, health, and the experiences of creative women in finding/expressing their own voice. Rukeyser (1913-1980) was a poet, feminist, bisexual, activist, Jewish woman from New York. I'm not very good at describing writing but her poems have stood out to me because of their confronting nature and honesty, particularly for the era she was writing in. I am inspired by her activism and also feel a closeness because of my visit to New York last year - it is a place that gets under the skin for sure. As part of the research for this project, Marian lent me the documentary Water Whisperers / Tangaroa, which looks at the stories of various river systems in New Zealand, and what has been done by various communities to improve their local ecology. It's a very uplifting doco - beautifully shot, with great interviews. 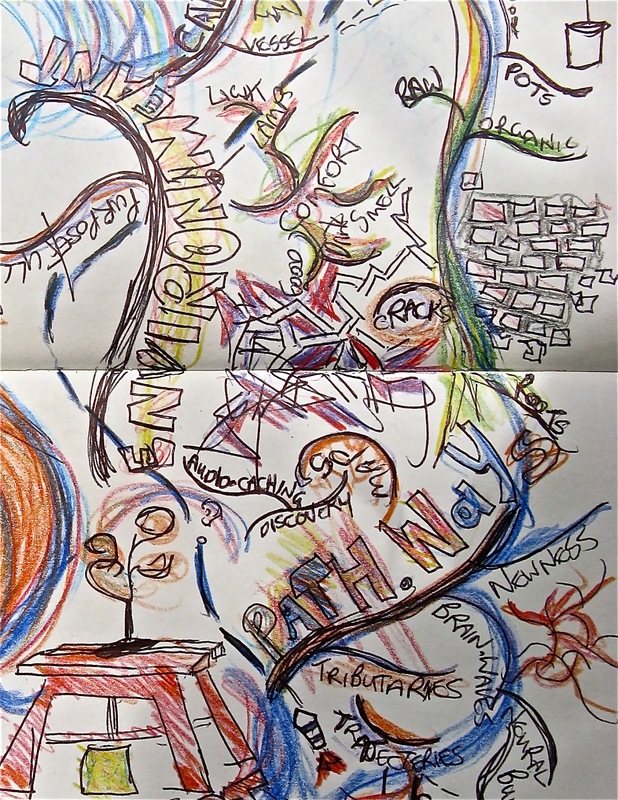 The documentary was powerful for me on a few levels - particularly in the use of metaphor of the body to the river. The river system is like our bodies a North American Indian explains - and damming it is like creating tourniquets which deaden the system further down. This idea is also echoed by Maori. We are now so used to thinking about the land in terms of the body as a way to give us an in-road for relating to how important care for the land / waters are. I was struck by the reverse of this more so - hearing the story of how the Ohinemuri was basically a dumping ground for sewerage and toxic waste and needed for a system of regeneration to be established, brought home to me the change that has occured for me in regards to how I view my health and own body. Before my body exploded with major eczema for the second time in my adult life, I remember a specific occasion driving through Mana, in a hurry, and having a vague knowing in my mind that I wasn't happy with how I was eating, with how I was living...eating on the run a lot, eating a lot (some things don't change! ), eating quickly thrown together pastas or stir fries where the veges were practically unrecogniseable. I have never been a good cook but one thing in my favour is that I've never shied away from preparing food for myself - even if I was the only one to sit down to a meal. But the nature of how I was eating - on the run...drinking lots of tea and coffee, snacking whatever was at hand - it just didn't feel right but I didn't know what to do about it. I felt overweight and even though my weight has never really worried me, I knew that I could be feeling better, more energetic - but didn't know what to do about it. I was like the Ohinemuri - dumping toxins in at a rate of knots and holding a ton of stress. So - when you want something, and you don't know how to go about it, something is bound to change...and even though my intention wasn't conscious enough that I was making a plan to do things differently - it was strong enough that eventually my body took over and said Enough already...and in came the eczema...like a flood. It was one of the most uncomfortable years health-wise I have had (preceded by vertigo)...but the timing of it and of some random searching on the internet at the same time led very quickly to my discovery of juicing - giving digestive system a break and flushing out acidic residue and oxygenating the blood...much like the community of Ohinemuri were to do. Watching the doco brought home to me the amount of revolution that has occured in the area I am most able to control - my body. It certainly isn't perfect (I still reach for the foods I've grown up eating and get 'the taste' for when stressed or if they are conveniently available) but the most important thing is my intention has completely changed and I can pretty much say that something within me has made a switch and I am on a new path. Watching the doco - hearing the stories, science and reasoning behind the logical, common-sense approach to maintenance of an ecological system through management and cleansing - really brought home to me how important it has been for me to do this for my body at this stage of my life. anyways....given that I used to be quite the evangelist back in the day when I was small, I have no interest in trying to convert people to anything (though as anyone will attest, when one is in the throes of a life-changing discovery or event that is often all they want to talk about). I am a bit allergic to really putting the word out there nowadays and yet I think over time I will find a way to do this that feels right for me. It is amazing too that change is contagious, and when people want the best for themselves, and they see changes in people they love - well - that is true gospel testimony, and people always want to go toward light when they see it and when they looking in the backs of their minds. So it astounded me when people close to me decided to try some of this on just from what they have seen me go through. It isn't over for me - the true test will be in the long term as my eczema is currently controlled by some pretty heavy duty drugs - so when I come off them, and when I can finally clean up on eliminating toxic foods - that will be when I can declare true healing. The skin being the largest organ in the body - it is hard to heal but not impossible - just takes a while. The other amazing thing from this doco - oh yes back to the doco - is the link with the path my music-making has been taking. I have been experimenting with a style of performance in which a sound-making environment is created and from that songs, stories, parts of songs are interweaved. You can read more about the background to it here. 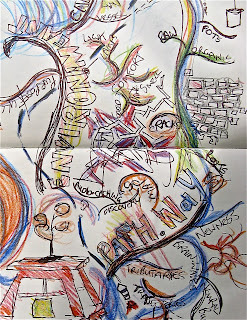 The interesting thing about the mind map is that there is a specific reference to environment and tributaries - echoing the patterning of neural-pathways, the patterning of nerves, of rivers - the relationship of body to land to waves of sound.